Description: BNSF 500 leads a whole bunch of locomotives. Description: Two B40-8's work there way towards the shops while a remote SD39-2 waits it's next assignment at BNSF's Galesburg yard. Title: BNSF 506 Sits in front of a wrapped unit. Description: anyone know what unit this is? Title: BNSF 500 Roster shot. Description: First unit of the (B40-8W) Units. Description: Staged up waiting for their next assignment. Description: BNSF 500 isn't doing so well. Based on other pictures, it's been sitting in this spot for quite some time. The battery box below the cab is hanging on by duct tape and it is missing it's traction motors. Hopefully it will get rebuilt and returned to service, but it's doubtful since GEs don't have a very good record of being rebuilt. Sad to see this former SuperFleet class unit like this. Description: BNSF B40-8W 500 was in the processed of being rebuilt at the Wabtec/GE plant in Fort Worth. 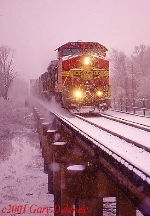 Description: BN train 144 zips across the Meremec River bridge on the BN River Sub south of St. Louis.